Iranian-Azerbaijani relations have been firmly on track toward rapprochement since the election of President Hassan Rouhani in Iran and the subsequent progress on the nuclear deal and lifting of Western sanctions. In the last five years, the presidents of Azerbaijan and Iran met 12 times, and official delegations from the two neighboring countries have made around 100 bilateral visits and signed more than 50 cooperation agreements (Economy.gov.az, March 5). Both sides have repeatedly emphasized strong confessional, cultural and linguistic ties as the basis for advancing cooperation; and Iranian officials have voiced their support for the resolution of the Karabakh conflict within the territorial integrity of Azerbaijan (Trtworld.com, January 22). Even though the United States has since moved to reverse is support for the nuclear deal (the so-called Joint Comprehensive Plan of Action, or JCPOA) and re-imposed sanctions on Iran, Azerbaijan remains steadfast in its policy of expanding bilateral cooperation with the Islamic Republic. On March 5, a high-level Azerbaijani delegation headed by Economy Minister Shahin Mustafayev visited Iran to take part in the opening ceremony of the 164-kilometer-long Gazvin–Rasht railway, part of the North-South Transport Corridor, sponsored by a trilateral partnership of Azerbaijan, Russia and Iran (Azertag.az, March 6). Within the framework of this partnership, Azerbaijan and Iran have already completed construction of the railway bridge over the border river Astarachay, and they are currently working on the construction of a cargo terminal on the Iranian side of the border. Earlier, Azerbaijan also agreed to allocate $500 million of credit to Iran to build the Rasht–Astara railway, another element of the same North-South Corridor that will link the rail systems of the two countries (Azernews.com, April 24, 2016). Several days after the opening ceremony, Azerbaijani Foreign Minister Elmar Mammadyarov visited Iran to meet with his Iranian counterpart Mohammad Javad Zarif, and other high-ranking officials (Azernews.az, March 10). On March 14, Iran’s Finance and Economic Affairs Minister Farhad Dejpasand visited Baku to co-chair the 13th meeting of the Iranian-Azerbaijani Joint Economic Cooperation Commission and the Iranian-Azerbaijani Business and Investment Forum (Mehnews.com, March 14). During the visit, he called for a preferential trade agreement between the two countries (Tehran Times, March 15) and stated that the neighbors agreed to improve cooperation in the fields of oil and natural gas, transportation and transit, electricity, trade, investment, and tourism (The Iran Project, March 16). Currently, over a thousand Iranian companies are doing business in Azerbaijan, and their investment in the country has exceeded $3.4 billion. In 2018 alone, annual bilateral trade increased by 74 percent, reaching $446 million (Azernews.az, March 6). Though this figure only reflects about 1.5 percent of overall foreign trade turnover in Azerbaijan, it nevertheless constitutes an important portion of the country’s non-oil trade. Moreover, in 2018, Iran became the sixth-largest exporter to Azerbaijan. That same year, 240,000 Iranian tourists visited this former Soviet republic, making Iran one of the largest importers of tourism services from Azerbaijan (Qafqazinfo.az, March 15). It is important to note that the major problems that had generated mutual suspicions and kept bilateral relations strained for most of Azerbaijan’s post-independence history have recently been largely resolved. The major issues that made Azerbaijan wary of its southern neighbor included Iran’s attempts to spread its own version of Shia Islam to Azerbaijan, disputes over maritime borders in the Caspian Sea and ownership of some offshore fields, as well as Tehran’s cordial relationship with Yerevan, Baku’s foremost adversary in the region. It seems that, in contrast to Mahmoud Ahmadinejad’s presidency, controversies around religious affairs and attempts to export ideology have become secondary for Iran’s more pragmatic and moderate Rouhani government in its relations with Azerbaijan. Bilateral tensions and disagreements in the Caspian have also been greatly eased, as the two neighbors signed an agreement on joint exploration of their disputed oil fields in March 2018 (see EDM, April 5, 2018). Furthermore, the two countries both joined the three other Caspian littoral states to sign the Convention on the Legal Status of the Caspian Sea in August 2018. 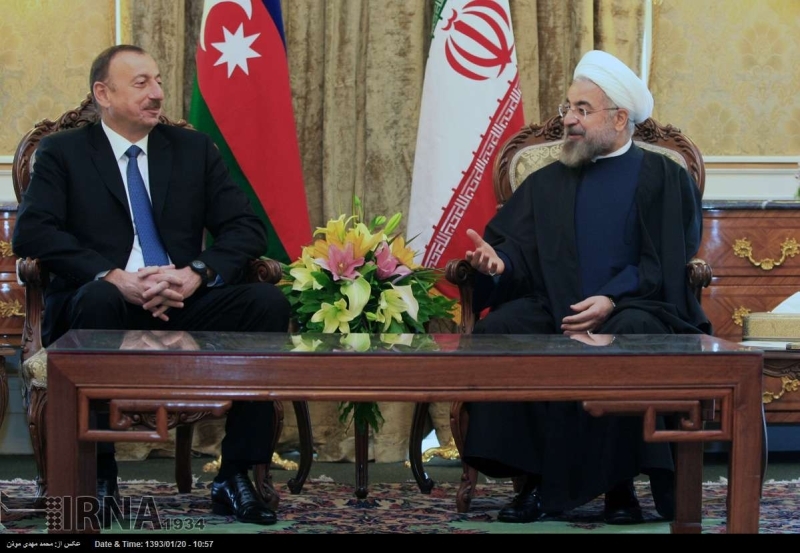 And with regard to Azerbaijan’s concerns about Iran’s relationship with Armenia, Tehran has sought to reassure Baku by voicing support for Azerbaijan’s territorial integrity at every high-level meeting the two sides hold. In turn, Tehran has long been concerned that Azerbaijani territory could be used for military purposes, particularly for intelligence operations, against Iran by the US or Israel. To address this worry, Azerbaijan’s 2010 Military Doctrine formally declares that the country’s territory cannot be used by foreign powers for aggressive activities directed against any of its neighbors (see EDM, March 5, 2018), and the new National Security Concept includes a clause that no foreign military bases can be established on Azerbaijani soil (Sputnik.az, July 21, 2016). Thus, resolution of these problems—which were both partly the reason and partly the result of the recently improved relations—is presently sustaining the pace of Azerbaijani-Iranian rapprochement. However, despite these improvements, the bilateral relationship is not entirely free of residual problems. On February 11, in an event dedicated to the 40th anniversary of the Islamic Revolution, President Rouhani stated that during the rule of “the traitor Qajar dynasty, 205 years ago” (the Qajars ruled Iran during 1789–1925), large portions of lands in the Caucasus were separated from Iran (Alarabiya.net, February 11). Rouhani’s remarks thus echoed Persian nationalists’ long-held territorial claims against Azerbaijan. Moreover, Armenian Prime Minister Nikol Pashinyan visited Tehran on February 27 and was warmly received by the top leadership of Iran (Contact.az, March 9). Pashinyan met with the Armenian expat community in a sports hall in Tehran, where an enormous banner affixed to the wall proclaimed in Armenian “Karabakh belongs to Armenia”—footage of this irritated ethnic Azerbaijanis both in Iran and Azerbaijan. The Azerbaijani minority, which constitutes more than a quarter of the overall Iranian population, protested the visit on social media. And during a soccer match in Tabriz, the capital of Iran’s East Azerbaijan province, local ethnic-Azerbaijani spectators raised Azerbaijani flags and chanted slogans critical of the Iranian government (Times of Isreal, March 5). Protests also took place in Azerbaijan, with a small demonstration on March 2, outside the Iranian embassy in Baku. The protesters denounced not only Rouhani’s statement and Pashinyan’s visit but also general discrimination against ethnic Azerbaijanis in Iran (Amerikaninsesi.org, March 2). It bears noting, however, that hands-off approach to the demonstrators of the police may indicate this protest was an informal, government-sanctioned way for Baku to convey its dissatisfaction with Rouhani’s remarks and Tehran’s relationship with Yerevan.